1. SPRING – the new tulips pushing through the ground. for this one i actually looked up photos on flickr, although i should have went and drew some tulips in someone’s front yard. 2. SUMMER – the colors in this hat were inspired by this one beautiful garden in vancouver that i passed every day along the bike route. one day i stopped to talk to the woman tending it, and told her about the hat. 3. AUTUMN – i think that this hat ended up being autumn to the core, although i had no idea that was what it would be when i started knitting it. i was limited in wool at the time and just stared working with some colors. then it languished until quite a while later when i found the right embroidery for it. some green, some gold, some red, just turning and fiery. 4. WINTER – the magic that is snowflakes on a hat to keep the head warm during the snows. i do a lot of walking as my primary source of exercise, and find that it allows me to notice much about what’s going on in the physical landscape. even walking in the city provides the sensation of the wind on your face, new things growing or old things dying, cycles. i find that embroidering creation helps me to further connect with the seasons, and i hope that the person wearing the knit gets to do the same through my art. i think that sensing our surroundings in the busy hurriedness of life is a priceless gift, and focusing on little things that are happening in nature leaves me wondering, thankful, and awestruck. and, as always, with some really deep metaphors from which to understand life and living. 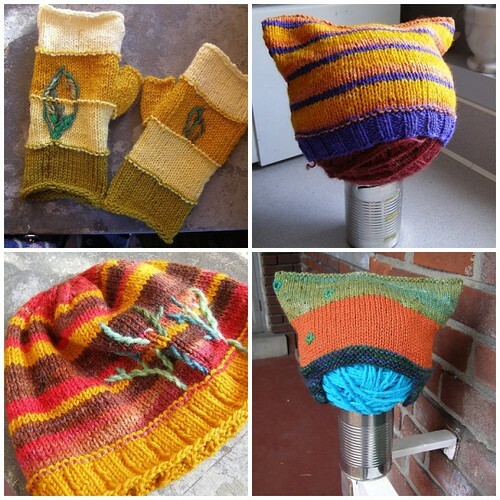 This entry was posted in cosyknitsliterally, embroidery, inspiration, knitting by cosymakes. Bookmark the permalink. Everything that you make is so incredibly creative & beautiful! These are no exception! I love seeing your creations & pictures. i just love the color combinations you use. Hi, I just picked up your book and I am in love. Okay, I knew that I would be in love before I even bought it. I mean look at all of the beautiful, creative wonderful things you make. Can’t wait to start making your gorgeous projects!! The tulip mitts are beautiful and I really like the detailing on the large leaf. I walk quite a bit too – and get much of my inspiration from nature.